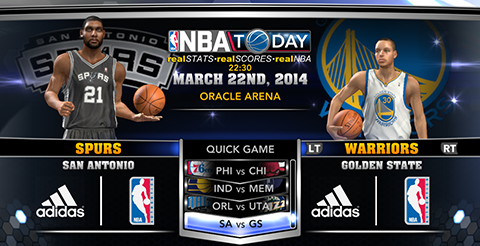 The March 22nd NBA 2K14 roster from 2K sports is now available for download on all platforms. A few players have been moved from injured reserve back to team rosters and tons of ratings adjustments were made. Many players still remain missing from the rosters. Those with expiring contracts are very unlikely to be added. Boston Celtics signed Chris Babb for the rest of the season, multi-year contract. Charlotte Bobcats signed DJ White to 10-day contract. Cleveland Cavaliers Seth Curry to 10-day contract. Brooklyn Nets signed Jorge Gutierrez to 2nd 10-day contract. Miami Heat signed Justin Hamilton for the rest of the season. Atlanta Hawks signed Mike Muscala for the rest of the season, multi-year contract. Sacramento King signed Royce White to 2nd 10-day contract. Orlando Magic signed Dewayne Dedmon for the rest of the season. Washington Wizards signed Drew Gooden Gooden for the rest of the season. Philadelphia 76ers signed James Nunnally to 10-day contract. Philadelphia Sixers placed the contract of Eric Maynor on waivers. Philadelphia 76ers signed Darius Johnson-Odom to 10-day contract. Grab the latest official roster by going to 2K Share or go to main game menu for next gen users. PC users can install the roster manually. Just use download link below and follow the directions included in the patch.